Total Footcare has been established for over 20 years and can offer a full range of traditional treatments as well as providing the latest innovations in foot care. We specialise in treatments for elderly patients and visits to Nursing and Retirement homes can easily be arranged. Routine Nail Care - Palliative care of the feet, maintaining nails and removing painful corns and callous caused by day to day living. Athletes Foot and Fungal Nail treatment - Diagnosis and treatment of this condition. Sports related problems and Biomechanic assessment (Insoles) - When feet are under impact the alignment of the bones can cause trauma not only to the feet but also to the rest of the skeleton, leading to pain and stress. Biomechanics is the study of the foot shape and the science of realigning it through the use of insoles. 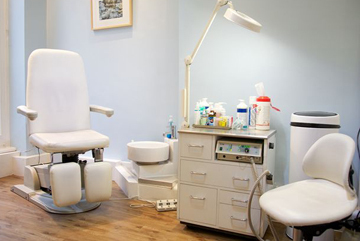 We specialise in Nail Surgery and Treatment of Ingrown Toe Nails - Severe and irritating nail problems can result from trauma, footwear, or biomechanical problems. This may result in the need for the removal of the problem nail or part of it, under local anaesthetic. We offer a range of Specialist Treatments including: Medipedi –the medical pedicure-beauty for the feet - please contact us for more details. Out of hours (late evenings and Saturday mornings) appointments are also available so for prompt effective treatment in the comfort and privacy of your own home or office contact us today. 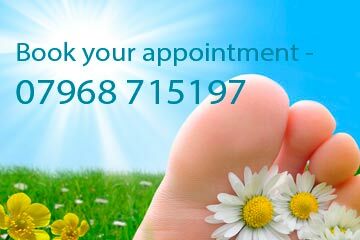 Arrange an appointment with Total Footcare for professional advice and treatment of a wide range of Foot Problems.